This is one of the author’s many books on the subject in a ‘Landscapes and Evolution’ series from OUP. All the world’s deserts are covered, though only Sahara one is reviewed here. Thirty percent of the planet’s continents are defined as desert and of the 444 pages in this book, Sahara gets 64. It’s divided into ‘Sahara’ and ‘Libyan Desert’ chapters, a designation that originates with Bagnold (see Libyan Sands, p.181). Geographically I must say I find this reasoning a bit abstruse (with political overtones of ‘French Sahara’ v ‘Our Desert’), but of course many contiguous desert areas, Australia being a good example, are labelled as separate ‘deserts’ whose boundaries are even more vague. 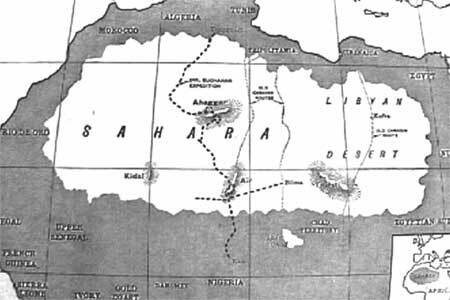 And interestingly, the map right from 1926 identifies the Libyan Desert as separate from, if adjacent to the Sahara. As a way of learning more about the Sahara’s landforms, I found the Sahara chapter (where some maps depict the ‘full’ Sahara) a bit unsatisfying, with focus on certain areas like the Chotts, the Chad Basin and even the Inland Niger Delta. I could well be missing some arcane academic point about desert landforms, but it seemed the same case in the Australia chapter which I know well too. The Libyan Desert chapter is actually limited to Egypt from where one presumes most material is easily available and is a bit more meaty, with the paleo-rivers beneath the Great Sand Sea, the Gilf and the many depressions discussed in more detail and in both chapters the fluctuating climate – particularly the Holocene Wet Phase which coincides with much of the Sahara’s rock art – is described. For anyone wanting to go further, there are countless references, good maps and tables but at £90 this book is for specialists only. A similar book written 30 years earlier is Geomorphology in Deserts by R Cooke and A Warren. You can find it used on the web for around £15 and it’s as informative, even if the science has moved on a bit. This entry was posted in Desert Babbles (blog) and tagged GREAT WARM DESERTS OF THE WORLD on September 4, 2012 by Chris S.